Howard Dinits marches to the beat of his own drum. He sells houses, raises chickens, and drives a car he runs on bio-diesel. He is fun and bright like the colorful and unique aloha shirts he wears when working. Most importantly, he loves what he does: helping Buyers and Sellers with real estate. Born and raised in Northern California in the San Francisco Bay Area, he grew up in San Mateo and attended the College of San Mateo and Santa Rosa Jr college where he studied marketing, real estate finance and small business management. Howard and his wife have lived in Hawaii 16 years; five years spent on the Big Island in the Puna district in Pahoa, and eleven years on Maui in Kihei. In his free time Howard enjoys gardening, morning walks, making local videos, bike rides on his Dyno Cruiser, fine dining and hosting parties with friends and neighbors. Howard enjoys a healthy lifestyle which includes a vegetarian diet. 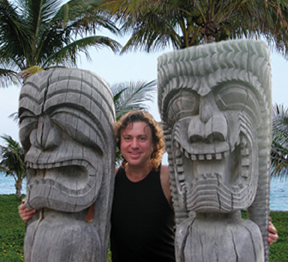 Howard spends most of his time on Maui, but still maintains homes on two Islands. He partners with top agents on Oahu or other neighbor islands to help clients throughout the state. Believing knowledge is power, he flies inter island or to the mainland for classes and to network with other top realtors around the country. An avid professional, he is always surfing the wave of new skills and technology. 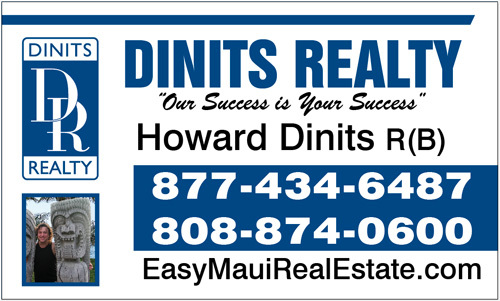 Howard draws on skills from previous experience as a mortgage broker, web designer/marketer, and a real estate investor to make him a top realtor in Hawaii. Working with banks as an REO agent, Howard knows how they work. When people have serious real estate issues Howard Dinits can help resolve problems, even helping homeowners when they need to avoid foreclosure and short sell their properties. 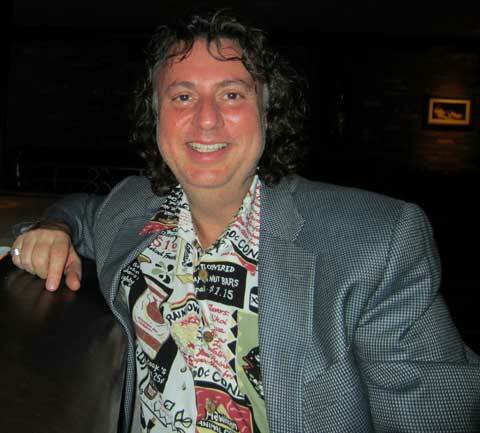 He has built premiere websites over the years, which connects both buyers and sellers with information and the ability to work directly with Howard Dinits. Consumers want an honest and comprehensive response quickly and Howard makes it all possible through email and social media like Facebook, Twitter, YouTube, LinkedIn, Google+,Yelp, Foursquare, among others. Real estate websites today need to incorporate web 2.0 skills. On Howard’s sites you’ll see virtual tours, streaming video, daily news, things to do, neighborhood and relocation information . His mobile app for his website, EasyMauiRealEstate makes it possible for Buyers to shop for real estate from their phones while they are on the go. When listing properties, high quality photos are crucial. Howard uses proper camera equipment, lighting and staging to show the property at its best. A detailed description including driving directions is vital as many consumers find it easier to drive by a home first before deciding to ask for a showing. Listing the home at the right price gets showings, calls and action on the property – many times it can even get multiple offers! Howard volunteers for the Technology Committee at the Realtor Association on Maui and is a vocal proponent for SentriLock, the latest in safe and secure showing technology that would benefit Buyers and Sellers. Agents would have a card to open Lockboxes that would track who and when they showed properties. Seller’s would benefit as this is a more secure system than leaving keys in hiding places or boxes that can be opened by anybody who has the code. Agents will be able to show properties to Buyers without the hassle meeting Listing agents or driving to pick up and return keys. Howard supports and uses a similar system on the Big Island with Supra Lock Boxes. With his over 350 happy clients talking story about him and his honesty, integrity and hard work, Howard’s business continues to grow. Instructors for Certified Residential Specialists and Resort Second Property Specialists have been known to use Howard’s marketing to give examples to agents around the country what they could be doing in their markets. Howard owes all of his accomplishments, to his wife Mary for all of her help and understanding of the amount of time and energy that is required to be the Best of the Best.